According his post-match notes 5th September 1988, trainer Joe Clavin commented that "the lads need a lot of training and hard match practice. Fitness levels are very low." For us all involved, we can indeed confirm that under Joe's training schedule fitness levels did improve and subsequent "hard" matches were followed by even tougher training sessions on the green swards of Tymon Park. This first ever adult hurling game was a friendly against our near neighbour Faughs. Credit must go to Frank Gallagher who was instrumental in attracting Joe Clavin to St Judes in1988. Frank, a long serving member of the club, regularly asserted that while his knowledge of the finer aspects of the game of hurling was "limited", he saw the need for the development of an adult hurling team in the club to provide continuity for the ever - increasing juvenile section. Frank had been a selector to many Junior and Intermediate club hurling side since, as well as long-serving Junior Hurling Board delegate. They were joined by Martin Molamphy in the first management team set-up. joe. ClavinThis Junior hurling team started off originally in the Junior C league. However, following our first competitive outing, we were quickly promoted to Junior A. The team was back - boned by former Robert Emmets players, by then disbanded, along with a group of Garda players who were clubless on the Dublin scene. Michael Ryan was instrumental in bringing these hurlers to Tymon and it started a long and fruitful relationship with the "Law"!!!. A number of players who were living locally were also recruited along with local school teachers Eamonn Tracey and Peter Lucey. The spirit and camaraderie in that squad was remarkable and bore fruit when St Judes, the minnows of Junior hurlers, defeated a fancied St Vincents team in the Junior A Championship final in Parnell Park on Wednesday 26th July 1989. While this great achievement had put Naomh Jude on the hurling map, the tremendous work at juvenile level would soon reap even greater rewards. Success at Minor 3 level in 1990 would soon provide a number of players for the 1991/92 season and beyond. Such names as Fallon, Feore, Orr, Ryan, Nolan, Duggan, McLoughlin, Reen, Colgan, McGovern, Molly, Crennan and Sheehy would soon be entering the fray. In the Autumn of 1990 Joe and Martin left the management of the team to be replaced by "rebel" Peter Lucey, Martin Hayes and Mick Reidy. Lucey took over training duties also and all three continued as players for some time. By now also the noteworthy "Mines" man, Gerry Ryan had joined the panel. Gerry would go on to captain many club teams and become the only Judes hurler to hold championship winning medals at Junior A, B, C and D level - a remarkable achievement indeed. The 1994 season saw this Junior team make a serious impact, going through the entire league campaign undefeated but losing narrowly to St Vincents in the play-offs. However, promotion to the Intermediate grade was achieved through victory over St Vincents in the Top four final. The 1994/95 season will long be remembered in the hurling history of the club. Within the under 21s having a great league run and reaching the quarter final of the championship, a remarkable tremble was on the cards. Victory in the Intermediate Division 2 league and promotion to Division 1 was achieved at the expense of Lucan Sarsfields in a league play - off. 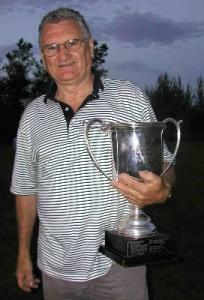 The Doyle Cup found its way to the club following a great win over St Vincents in a replayed final. The treble dream was shattered by a narrow defeat to Naomh Mearnog in the final of the Junior A Championship. 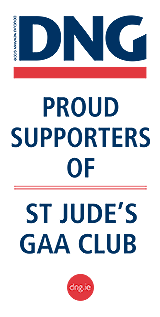 1999 saw St Judes compete in Senior hurling, both league and championship for the first time in the club's history. This indeed showed great progress for a club whose first adult hurling team had been fielded only 10 years previously. Team mentors were Peter Lucey, Michael Ryan and Colum Grogan. Our first championship game at senior level saw us take on Eugene Murray's former club, Kevins, who had too much experience on the night. By the start of the 2002 season David Ryan and Bart Lehane were regular starters on the senior team and Vincent Kelly, SeÃ¡n O'Connor were seriously challenging for senior positions. Liam O'Reilly and Aidan Hassett were also wearing the Judes jersey at this stage. 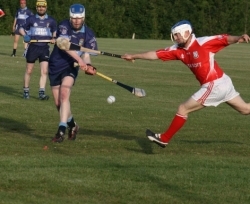 Ryan boys in attack.JPG Thumbnail1.jpgOur Juniors once again excelled and under Gerry Ryan, Cummings and Grogan, brought the only remaining Junior Championship title, the Junior B, to the trophy room with a deserved win against neighbours Boden. This victory completed the full complement of Junior Hurling Championship titles for the club. 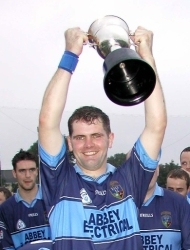 Success continued with a tremendous win for the Under 21 Hurlers in 2006 with a late goal by SeÃ¡n O'Connor. And so, while Judes enjoys 30 years of sporting activity in Cumann Luthchleas Gael Naomh Jude, we celebrate all that hurling has given us in a much shorter time-frame. We have been fortunate to have collected much silverware in that time.